Karuna (Vishal) is an army man who has anger issues. When he tries to apply for personal loan for his sister’s marriage, all banks reject his loan application. Then a broker contacts him and convinces him to apply using fake documents. In return, Karuna pays him his commission in form of cheque. After a couple of days, all the money vanishes from his bank account. Then Karuna realises that there is a clandestine network that robs people of their money in digital form. Rest of the story is all about how he chases the maze and bring the culprit to book. 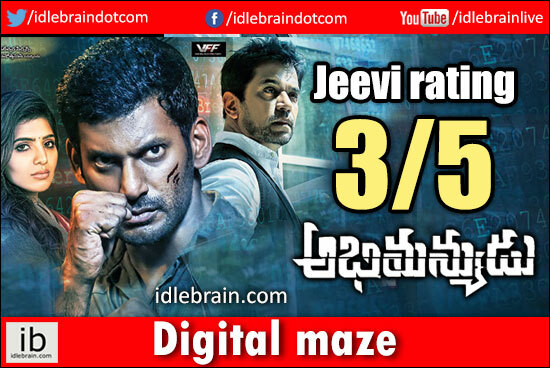 Actors: Vishal comes up with terrific performance as an emotionally drained man in few scenes. He brings believability to the role of an angry man with his body language. Samantha does well as a psychiatrist and continues her winning streak. Arjun Sarja is excellent as a sophisticated cyber criminal. Arjun gets a deserving character after a long gap. Delhi Ganesh is good as a troubled father. Story - screenplay - direction: Debutant director PS Mithran comes up with a story which very relevant to present society. This story explores the dangerous side of smartphone and explains how hackers can syphon off money from unsuspecting smartphone users. Though the story handles with hi-tech concept, the director has used family emotions to narrate the story. Most of the first half is dealt in family bonding. By making the hero of the film a victim, the director made sure that emotion is sustained throughout the second half. Screenplay of the film is interesting. Second half is little lengthy and with loads of fights. Other departments: There are no songs in Tamil version, but the producer had to add a duet in Telugu version. Background music by Yuvan Shankar Raja is nice. Cinematography by George C Williams is good. Editing by Ruben is good. Dialogues are contemporary. Fights are effective. Production values are good. Analysis: Dealing with a technical subject is very difficult. Director PS Mithran creates a simple backdrop and writes screenplay in such a lucid way that it can be understood by everybody. Vishal chooses a contemporary script without sacrificing his forte of action orientation. Despite a lengthy second half and Tamil nativity, Abhimanyudu is a film that can be watched!